Monday night I watched the most amazing thing. I literally stopped to stare because I was so excited. Max has been grabbing onto things for a couple of weeks now. He has been kicking things since before he was born. But tonight was the first time I saw him use his feet and hands together to achieve something. It took my breath away. 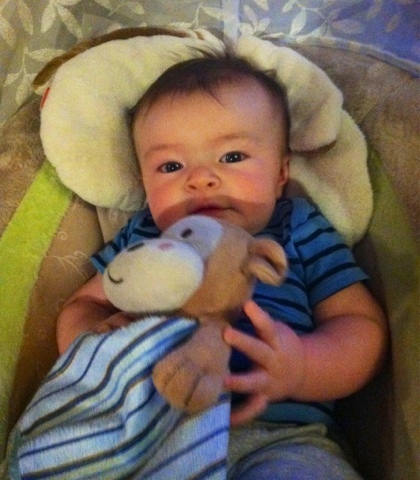 He was laying in his swing, relaxing with his cuddly monkey (see picture for reference). He accidentally threw it into his lap, down between his feet. He reached for it with his hands, but it was too far away. He looked at it for a moment, and then his feet started to move. He used his feet to push it up, and at the same time he reached forward with his hands to grab it. It was beautiful to watch him learn to do that. It's the little things like this that I'm glad that I take a moment to witness before moving on to the next thing. And then the monkey went straight into his mouth. A normal moment for him, but phenominal at the same time. That's out little boy!